As part of their Roadway Safety Data Program the FHWA recently published an interesting case study featuring one of MS2’s oldest and most technical clients, the Southeast Michigan Council of Governments (SEMCOG). Titled “Innovative Traffic Data QA/QC Procedures and Automating AADT Estimation,” the case study focuses on AADT calculations – an important traffic engineering function to MS2 clients throughout North America. 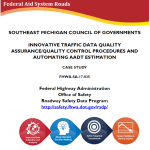 According to the case study abstract, “This case study highlights two noteworthy practices at the Southeast Michigan Council of Governments (SEMCOG) regarding short-duration traffic count validation procedures and an automated annual average daily traffic (AADT) estimation process. SEMCOG maintains a centralized traffic count database and receives traffic counts from the local agencies in southeast Michigan. SEMCOG conducts 46 validity checks on all traffic count data to identify invalid data available in the database but not adequate for analysis.